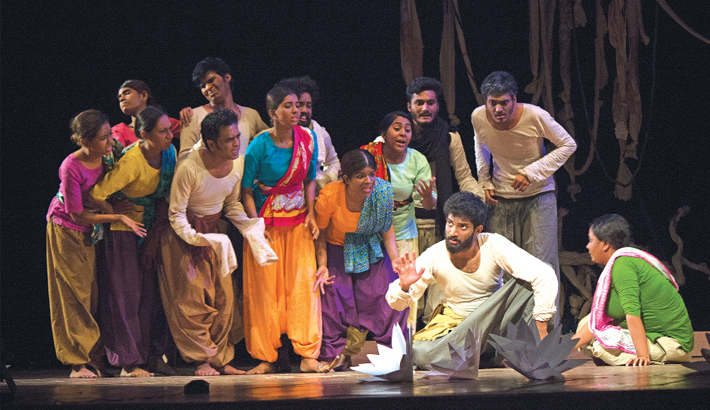 ‘Khowabnama’, produced by 35th batch of Prachynat School of Acting and Design and scripted by Md Shawkat Hossian Sajib, was staged on January 28 at National Theatre Hall, BSA. The play is based on novelist Akhtaruzzaman Elias’s well-known novel in the same title and directed by Kazi Towfikul Islam Emon. The performance was a part of the closing and certificate giving ceremony of the batch, where Dr. Khaliquzzaman M Elias and actor Bipasha Hayat were present as special guests while creative director of Prachynat Azad Abul Kalam and director of academics Shahidul Mamun delivered their speeches. The novel Khowabnama (The Saga of Dreams) is based on the life of the people of Katlahar and its surroundings in Bogura. In the novel, a number of historical events like Tebhaga movement, partition of Indian sub-continent, Battle of Plassey, Sepoy Mutiny and Fakir Rebellion have been depicted. In the novel we see that though the Zamindari system has been demolished, the common people do not get the benefits. Rather a group of new people emerge as new landlords due to different laws. Sharafat Molla, hailing from another village, is one of such persons, who becomes the new powerful man after buying lands of immigrant Hindus. He makes the life of lower-class people more miserable. However the performance was too messy and the acts performed on stage were not related to each other perfectly. The music was average while the stage and lighting design were also commendable to some extent.